As an African-American man who grew up in the 1970s, I was raised by parents who ensured I was proud of who I was, and where I came from. That we couldn’t trace our heritage to a specific location was beside the point. We knew and embraced the gist. I’m reasonably sure my heritage is African, even if I can’t point to a specific region. I grew up listening to all kinds of music, but next to none of it came directly from Africa. In fact, the closest I probably came was the Roots soundtrack from Quincy Jones in 1977. Within the realm of popular music, this wasn’t considered a big deal. I didn’t dive headlong into jazz until the mid-80s, when I would learn about Miles Davis’s desire to explore African rhythms during the 70s on Albums like On the Corner, Pangea and Agharta; or Herbie Hancock’s electronic explorations with the band he called Mwandishi, which also explored rhythms from the Motherland. Still, like most black Americans, I wasn’t paying Africa a great deal of attention, musically. That all changed in the mid 80s. Ironically, it took three young, very non-African musicians to help me see the value in African music. In August of 1986, singer/songwriter Paul Simon released an album called Graceland. In and of itself, a new album from half of Simon & Garfunkel didn’t mean a great deal to me, particularly because I had been taken into the bosom of King Crimson the year before. But this album was causing quite a stir, which got my attention. It seems Simon took it upon himself to venture to South Africa to explore the music of those native to the region. The move was deemed controversial, as South Africa was in the throes of Apartheid, the law of racial segregation placed upon blacks in the region by the white minority. It was Jim Crow for Africa, still in place a mere 20 years after America made the Civil Rights Act law. What the hell did Simon think he was doing? It’s a question best left to Simon himself to answer, which he does in a marvelous documentary called Under African Skies: Paul Simon’s Graceland Journey. The film was included in my 25th anniversary edition of the album, but I’m sure there are other places it can be found. Regardless, Simon’s trip yielded some incredible music, which sounds even better now that it has been remastered. I was introduced to some incredible South African artists like trumpeter Hugh Masekela and a vocal group called Ladysmith Black Mambazo. The way the singers augmented Simon’s songs defies description. It has to be heard to be understood. I was under the impression Simon was the first prominent white musician of the era to explore the sounds of Africa. That turned out not to be the case. A couple of years before Simon taught us about the music of South Africa, Stewart Copeland made his way to West Africa on a musical pilgrimage that resulted in an album called The Rhythmatist. The Police ranked among my favorite bands, therefore anything done by a member of the group (in this case, its drummer) was certainly worthy of my attention. And while Copeland’s vocal style was (and remains) rather jarring, there can be no doubting the massive influence brought forth by the percussive and vocal stylings of the African regions Copeland visited. Before I knew it, I was off to the record store to pick up some of N’Dour’s solo music, which wasn’t always easy. But I got lucky a couple of times after Columbia signed N’Dour, and released an album called Eyes Open. I don’t explore music from Africa as much as I used to, or should. But it’s definitely on my list of things to get back around to. Every time I hear music from that continent, regardless of the region, I can feel myself starting to move. The rhythms are amazing, and contain as many alternate times as my favorite prog and jazz acts. The use of instrumentation is always exciting, like with the sounds of Fela Kuti from Nigeria. And the vocals are beautiful, even if I don’t always understand what they’re singing about. Yeah .. I definitely need to get back into those sounds! So let’s set the record straight: it wasn’t two legendary African-American jazz musicians who showed a young black man the importance of African music. Nor was it an Afro-centric R&B artist eager to get back to his musical roots. It was a nice Jewish kid from New York, the son of a C.I.A. agent from Virginia (who grew up in the Middle East), and a British vocalist I heard first singing a little ditty called “Solsbury Hill” after leaving Genesis, one of my favorite progressive rock bands. Because of these three artists — and the open door that was my musical mind in the mid 80s — I became better versed in the music of the region my ancestors called home. It also proves that music belongs to no one in particular, and anyone willing to give it ears. If that’s not ironic, I’m not sure what is. 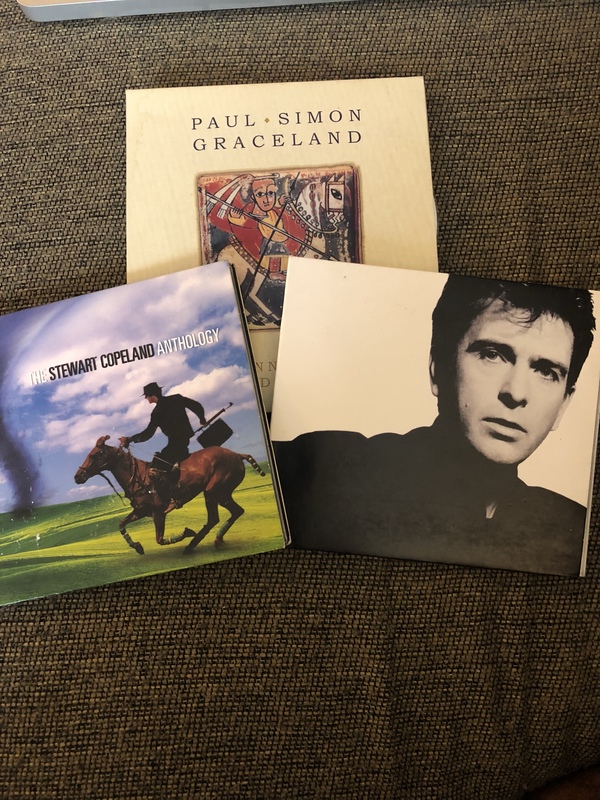 I love the Graceland album and was fortunate to see Paul Simon perform live in Germany in the ‘80s with the African musicians who played on the album – watching these musicians perform and the visible joy they got out of it was one of the best concert experiences I’ve had to this day. Good music transcends borders. And this post illustrates that beautifully.